It’s been a truism that data is a resource, but to prove it you just have to follow the money. 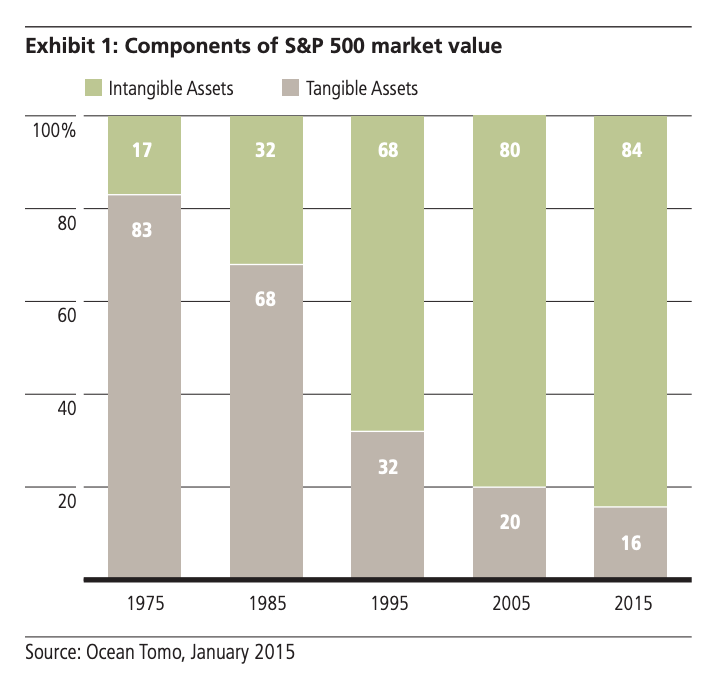 As the illustration shows, the vast majority of corporate market value draws from intangible assets. 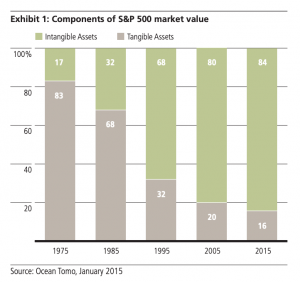 Just as money is an abstraction that represents wealth, data is an abstraction that represents these intangible assets. It’s year three after initial rollout of the Leader’s Data Manifesto (LDM). Since then, many widely publicized events have highlighted the value of data and metadata, and the importance of sound data management (here, here, and here). Recently at Enterprise Data World, John Ladley, Danette McGilvray, James Price, and Tom Redman presented this year’s LDM update. They reintroduced the Manifesto, recounted events of the past year, discussed strategy for the coming year, and issued a call to action for data professionals. Per Mr. Price, in 2018 the LDM emerged into the C suite based on a pure value play. In addition to the chart above, which he quoted, he presented one study finding that various knowledge professionals waste an average of eight to 13 hours per week due to poor quality data. Another cited an average benefit in excess of $20,000 per year per person for an investment including a data health check and implementation of sound practices at around $100,000 for some participating organizations. Going forward, LDM thought leaders will focus on machine learning as a “tip of the spear” to spur further data management interest and improvements. As both Redman and EDW19 keynote speaker Michael Stonebraker emphasize, machine learning is hamstrung without quality data. Whether a company is ready for machine learning or not, poor quality data blocks its progress in data science. Mr. Stonebraker quoted a data scientist at iRobot: “I spend 90% of my time finding and cleaning data and then 90% of the other 10% checking the cleaning”. Billy Tilson of Go Daddy cited resulting retention impacts. Data scientists are scarce, smart, driven folks with lots of employment options. Other things being equal they’ll readily choose hypothesizing and modeling over data cleanup. Organizations that effectively curate data have a substantial advantage in establishing a data science capability. So, data represents five sixths of corporate market value, poor quality data may cost your organization $20,000 per person per year, and data quality challenges can hamstring your company’s efforts to establish modern analytics. If you haven’t signed The Manifesto, do so at dataleaders.org, to support this movement and show that you are committed to change in your organization. If you’d like to support the machine learning initiative, first read Tom Redman’s article “If Your Data is Bad, Your Machine Learning Tools Are Useless” at Harvard Business Review. Then contact with Mr. Redman and let him know about your conversations with machine learning leaders in your company on data quality and how they are addressing this challenge. With the business case defined, and with future obstacles understood, I look forward to us working together to improve data quality by building awareness and promoting sound data practices. *The calls to action are from “The Leader’s Data Manifesto: A Call for Action for Managing Data Assets”, presented at Enterprise Data World on August 20, 2019. This entry was posted in Data Management, Data Science, IT and tagged Alignment, Analytics, Big Data, Business Intelligence, Data Governance, Data Management, Data Quality, Data Science, Leading & Following, Professional Development, Strategy on March 30, 2019 by Bob Lambert. Data Integration Benefits? They’re Obvious.